I would like to take this opportunity as well to thank my former colleagues at credativ GmbH for their support of the PostgreSQL project and my own career. I wish them much success in their continued development. I'm glad there is so much interest in KDE 4.1. I'm going to give this another try on a fresh system without any previously accumulated cruft. In the meantime, I notice that the Debian lenny installer beta 1 does not boot in VirtualBox OSE as included in Debian. It freezes right after the "OK, booting the kernel ..." message. I had to run "install noapic nolapic acpi=off" from the boot prompt. (Perhaps you don't need all of these.) Does anyone know the reason for this? It'd be great if this could be fixed; otherwise using VirtualBox will become very annoying in the future, in my estimate. I tried the installation of KDE 4.1 beta 1 on Debian, as described here. I ended up undoing this about an hour later. The environment isn't really usable yet, so my advice to the public is: don't do it, on a system you plan to actually use. You can't configure size and appearance of the panel. This is a long-standing problem, but I thought it was fixed. In general, there don't appear to be all that many configuration options available to replicate various behaviors that I have become accustomed to. Rendering problems in the system tray; icons appear on top of each other. Various kicker widgets don't appear to be available for KDE 4 (yet?). Most applications don't copy their old settings, but it appears that some do? KMail doesn't interact well with encrypted IMAP accounts. I didn't try much beyond that, because I have no accounts that are not affected by that. Clicking on an RSS link in Konqueror doesn't link to Akregator anymore. Probably, various MIME type associations are missing. I couldn't get the environment to remember to open terminal windows maximized. Very annoying. I couldn't add any application icons to the panel. I'm not sure where on is supposed to store one's favorites now. So it was quite obvious that that various pieces don't really fit together all that well yet. On the upside, I noticed many really good ideas that I would look forward to using if the overall environment worked. The good news is that the packaging appears to be really robust (I found one packaging bug with a file conflict) and the upgrade and downgrade works well (you have to use aptitude, as described in Ana's post; apt craps out completely). So when KDE 4 is actually usable, Debian will be ready. But not for lenny; that would be suicide in my opinion. To conclude my expedition to PGCon in Ottawa, today I completed the Ottawa Marathon. A very well organized race to go along with a very well organized conference. Until next year. PGCon 2008 is over, and I couldn't help feeling somewhat sad. The second day of talks also featured many good presentations. My own also went quite well. We concluded the day with a meeting of the core team members who were present in Ottawa, and there will probably be a few actions coming out of that. Don't expect anything too dramatic, though. Thanks to everyone for this great conference, and I'll see all of you next year if not sooner. The talks were really good. I won't go into the details here; the slides should be available on the conference web site. For those not here I will summarize the sentiments of the day as Everyone is hiring. If to you, "vacuum" means cleaning the disk rather than cleaning the house, there appear to be literally dozens of jobs just waiting to be grabbed. In the evening we had the EnterpriseDB dinner. I think I caught a cold in the draft. Must save my voice for my presentation. Wednesday morning, I went geocaching again, attempting to complete the second UO cache, but ended up at a pile of rubble again. Hmm. Maybe this game works differently here in Canada. I hope I get to drop my travel bug before I leave though. The main event of the day, at least for the major developers, was the developer meeting, which I incidentally managed to locate with my GPS device. I was skeptical about this meeting beforehand, but I have to say, it was extremely useful and enjoyable. The wiki page linked to above contains the meeting minutes. So I guess I'm on the hook now to kill off some PostgreSQL mailing lists, and perhaps we'll have a prototype cmake-based build system for PostgreSQL sometime. I went geocaching this morning, because I have a Travel Bug to drop in Canada. But I only found a pile of rubble. Ran into Bruce just getting out of his cab from the airport on the way back. I presented my tutorial on porting Oracle applications to PostgreSQL in the afternoon. This went quite well, and I received encouraging feedback afterwards. The slides of the presentation should appear on the PGCon web site at the linked URL. For those who were confused by the somewhat cynical tone of the presentation: I have been traumatized a bit by the issue. By and large many applications are quite easy and straightforward to port. I certainly do encourage these efforts. The Oracle application is so carefully tuned with optimizer hints, it will never perform on PostgreSQL. We probably can't/won't port it. Half the time of a porting project will be required to tune the PostgreSQL port, because Oracle optimizes bad queries much better. Some things perform better in PostgreSQL, some worse. It probably averages out. With the money you save with PostgreSQL, you can afford better hardware. More insight on this issue would be welcome. I think I'll go on a second geocaching attempt now and hit the Royal Oak pub later with the rest of the group. We're back in town, Ottawa! I had to go through special interrogation twice at the airport (once for immigration, once for customs), but I made it. Now I'm sitting at the desk in the university residence, staring out the window down onto the city. Not much has changed; it feels like I was here just yesterday. How funny. I created the wiki page http://wiki.debian.org/LennyReleaseGoals to have some clickable and more selective links to bugs pertaining to lenny release goals. I found this helpful for selecting a bug to work on every day; perhaps this is useful for others as well. If someone has a clue about writing proper URLs into the bug tracking system, please contribute any improvements. Well, I asked for a wiki almost three years ago, but it is finally here in official capacity. Thanks! In the few weeks of its existence, we have already seen great progress in documenting many development issues that were previously undocumented or hidden in strange places. I have started to keep my personal notes and todo items, which were previously spread around various files and pieces of papers, under User:Petere. 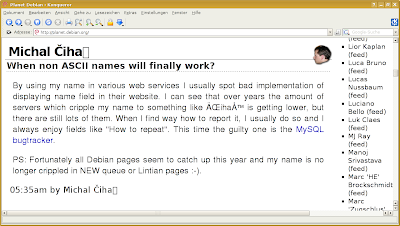 I have been observing the wikification in the Debian project for a few years now. I expect that in the near future, all of the contents relevant to developers will have migrated from the main web site to the wiki. I have signed up for the Ottawa Marathon on the weekend after PGCon. If anyone is still around on the Sunday, join me on or at the side of the track. Reinhard Max has revived the PostgreSQL RPM packages for SUSE and has given them a permanent place at the openSUSE Build Service. This builds on and supercedes my earlier offering, so please go to the new URL in the future. And please send your suggestions and contributions; it is "open" after all. By the way, the packages developed there are integrated into the official SUSE distributions, so it is the "real thing". The PostgreSQL RPM packages for SUSE have been neglected a bit recently. I have put up some packages for 8.3.0 and 8.3.1 at the openSUSE Build Service. Use the search interface to search for "postgresql". This won't be a permanent project of mine, but I'll probably continue as long as I need the packages myself and SUSE or someone else doesn't organize this job more sustainably. If your root mail goes to some place you read (probably a good idea), you will get a list of packages it wants to upgrade. When running stable, this will also effectively send you alerts about security updates. Obviously, a lot of people are having trouble with the removal of many implicit casts in PostgreSQL 8.3. While this will lead to more robust applications in the future, it will prevent many people from moving to 8.3 altogether at the moment. The problem why you can't simply make the casts implicit again is that in a somewhat unrelated development, 8.3 will generate a cast from and to text automatically (well, implicitly) for any data type, which is why most of the casts in question have been removed from the pg_cast catalog altogether and you can't simply run an UPDATE command to put them back the way you want. I have used a shell script to regenerate the removed casts including the required cast functions. The result is pg83-implicit-casts.sql. I have tested this against some of the recent "bug reports" I found on the mailing lists, so it should work for some people at least. If someone wants to use this, I suggest you only add the casts you really need, not the whole file. Those who stuck around one or two days after PgCon last year in Ottawa might have noticed that there were a lot of runners in town. As it happens the Ottawa Race Weekend will take place again this year the Saturday and Sunday after the conference. They offer everything from a short walk up to a marathon. I am considering signing up for one of the races this year. If any fellow conference goers want to join up in a type of PostgreSQL team effort, feel free to contact me. It has become apparent to me that the Linux kernels in Debian testing and unstable (2.6.2x) have all kinds of problems compared to the one in stable (2.6.18), especially when it comes to working with virtualization. I have been trouble booting newer kernels as guest systems in VirtualBox (bug #434723) and QEMU (and bug #449085). There is some chatter in the Gentoo forums to the same effect. I have also had trouble compiling the host system kernel modules of VMPlayer and VirtualBox with newer kernels. If your job requires regular juggling of virtual machines and operating systems, this creates big problems. Plus my UMTS card stopped working (bug #433750), also confirmed by Gentoo chatter. :) I have also tried to build pure upstream kernels myself, but they have the same problems. So my advice to those running Debian post-stable is to stick to kernel 2.6.18 from stable if you are seeing funny issues. A while ago I put the configuration files in my home directory (.bashrc, .psqlrc, etc.) into a Subversion repository so I could keep track of what I changed and distribute the changes to different machines. This worked well, but the choice of Subversion created a number of shortcomings: It was difficult to work with unconnected hosts (no local commits), it is difficult to make changes that apply only to some machines (branches, changesets? ), and you need a separate directory for the repository. Now I have converted this to Git, which appears to address these problems. The repository information is entirely contained in the .git directory in the top level of the working tree. I haven't transferred the tree to a different host yet, so that will be next week's project.